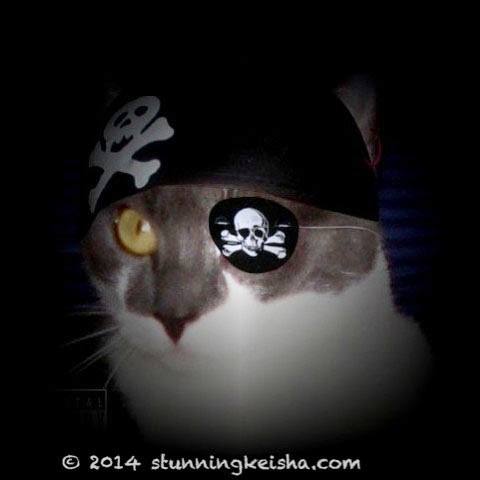 We made 'tis Arrr scurvy pirate art fer Meow like a Pirate Day weeks ago 'n guess what. TW lost it! Shiver me timbers! I thought 'tis message would be a snap but it took an hour to locate th' image. Sigh. 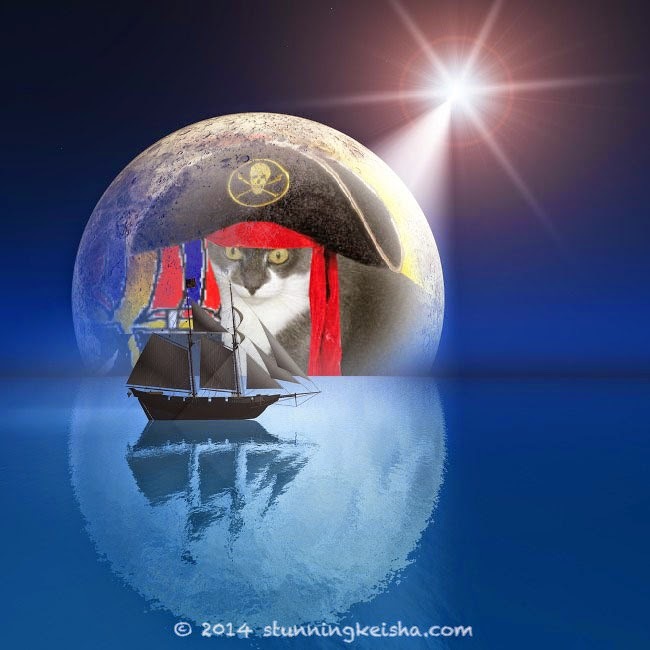 Even me header by th' talented Glogirly meows like a scurvy pirate. Call me Tessa Rose or better still Captain Tessa Rose. It's a name that matches with my adventurous personality. Legend has it I usually show no quarter if betrayed by a friend and have a short temper. Yes, I can be sweet when I want but might just blow a fuse. I take many risks and don't care about never making it back but I better not be late for a meal. I’ve had it wit' ye! Swim t' plank, Woman! It was a dark 'n storm nightfall as cap'n Tessa Rose 'n her crew took th' Black Paw, their sail out fer a cruise. If they were lookin' fer trouble, they found it. Shiver me timbers and arrr! To be continued next September 19th. LOL pawsome Captain Tessa Rose. Nice one. Yo ho ho and a bottle of milk to you and happy talk like a pirate day. Have a fabulous Friday. Yarr Tessa Rose we will enjoy the nip-grog till that fateful day comes again. Good thing we have lots of nip! Yarrrrrrr!!!! Ye look great as a pirate matey! Ye are looking all fine and mighty today CK!!! Do cruise on by for some Grog later! Wow CK you are a pawsome pirate! MerMry Pirate Day to ye! that be a right fine graphic--ye follered th' trail to it wi' determination (an' a few pirate werds, we bet), an' regained it as a precious treasure. that be fine piratry, indeed! Wow, that is one fantastic graphic. We really like that. Well done Glogirly. Happy Pirate day to you all. Garrr ye be a fine pirate wench. Come join me on my trusty ship the Ginger Furball and we'll sink a few measures o' grog afore we go looking for ships to plunder. Arrggh! A mighty pirate ye be making, Captain Tess Rose! We shall be seeing you on the Seven Seas! Aye, ye be a fine pirate, Cap'n Tessa Rose. Come share some nip grog w' us. Arrrrrrgh! Shiver Me Timbers - great post CK. My human was too lame today to help me with Pirate Day. She claims she was too busy with other stuff!!!! Arghgghhhh! Wow those awe sum gweat fotos. The image is pawsome. Wish we could do that. But layers is something we are just not able to stretch Mom L's old brain around. We wish, we wish...oh...and...arrggghh! ahoy me mateys. Ye're looking right fit for the sea. come on over and have a sail on me ship and enjoy the nip grog....mroowwww! Love your pirate image CK! Looking ravaging as always! Hey, Capt. Tessie Rose, did you see the ship run aground in the harbor yesterday? Oh, wait, you ran it aground. We have to wait until next year for the continued story?? Man, what a cliff hanger. MOL.